Paper Containers are used in restaurants to serve food in and as takeout containers. Chicken is a popular food served in round paper food buckets. Popcorn is another popular food found served in round paper containers. Try our paper french fry containers for your concession stands and sporting events. 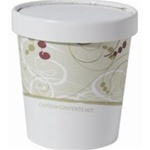 And of course our paper hot food containers are great for takeout soups and chili. We also have many painters who use our paper buckets to use for painting. Grease Proof Chicken Design Paper Bucket - 83 oz. 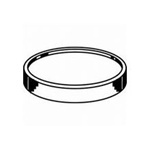 Buy wholesale Paper Food Containers from your restaurant supply superstore for takeout orders.